Just do things. That’s my answer to that question. Just do things. That’s my answer to that question. Most advice about finding your passion tends to be either ‘follow your heart,’ or, ‘don’t follow your heart, they’re lying to you.’ What neither of these pieces of advice take into account is—how does your heart know what it loves? How do you know you’ll love being an astronaut if you’ve never done it? And how do you know a career as an archaeologist won’t surprise you? We all know people who from birth knew what their passion was, achieved it, and love what they do. But we may also know people who achieved their dream and hate it. Lawyering bores them to tears. Charity work stresses them out more than they realized it would. Etc. And both of these types of people had to experience their passion in order to find this out. Your heart’s inclinations in and of themselves do not guarantee joy in what you do. So if life is in fact rather capricious, leading you on to think your love of numbers would make you a great accountant when it really doesn’t, how do you find a passion at all? First, let’s clear away the issue of whether we should have passions. We can argue all day about whether we should be searching for a passion in life. It is fair to say you should be practical and support yourself. It is fair to say you shouldn’t think of yourself only, but also of other people (as someone has to do the dirty work). It’s fair to tear down the myth of ‘following your heart.’ However, it is also undeniable that passion motivates us in a way nothing else does. We can’t ignore it completely, and force people to slot themselves into open careers like some kind of dictatorial sci-fi society. But keep in mind that you can be passionate about more than what rises up in your dreams. You can be surprised about what enjoy (and what you don’t enjoy). And by having an open mind and trying all sorts of things you can feel out your way. I thought I’d hate being a salesperson because I thought I’d hate being measured by sales targets. Then I discovered I really loved knowing exactly how well I was performing at any given moment, just by looking at my sales numbers. I also far exceeded my wildest sales expectations (which, admittedly, weren’t very high at first). I thought I’d enjoy learning about computers, but I didn’t want to spend the thousands on education needed to work in the field. But an agency recruited me to work in a computer store, an opportunity that I definitely wasn’t sure about. After all, agency work can be unreliable, and my education had nothing to do with retail. But doing something is better than nothing, and it was something I’d always wanted to learn about. Several positions later I am still constantly using tech troubleshooting skills that I picked up, because I confirmed I really do have a passion for that kind of thing. I thought I’d love having a worthwhile career that contributed to society and was indispensable, so I went to nursing school. I learned all of the abstract reasoning of selflessness did not translate into me being a good nurse. And presently I have made another major life decision—to go back to school to study theology. I know I have a passion for the subject, but I don’t know that that passion will translate into academic study on a daily basis. It may not. I’ll find out. If you already have a passion and a reasonable opportunity to pursue, go for it. If you have a passion and there’s no open opportunities at the moment, you have an opportunity to try something else. Experience something new. Don’t go and try something you know you’ll hate, but if you can’t do something you know you’ll love, do something you don’t know if you’ll love or hate. Experience allows you to find out. And if you’re really groping in the dark, as I’ve been for periods of my life, you can’t sit back and wait till you’re one-hundred-percent sure you’ve found your passion before you do anything. Granted, life usually doesn’t let you sit back and do nothing (bills to pay and all that), but ESPECIALLY if nothing sounds appealing you’ve just got to try things. Try to pick things that might lead to other things to try. Because after all you don’t find your passion by looking deep inside and thinking as hard as you can about what your heart is telling you. Your heart doesn’t know what’s out there in the world. 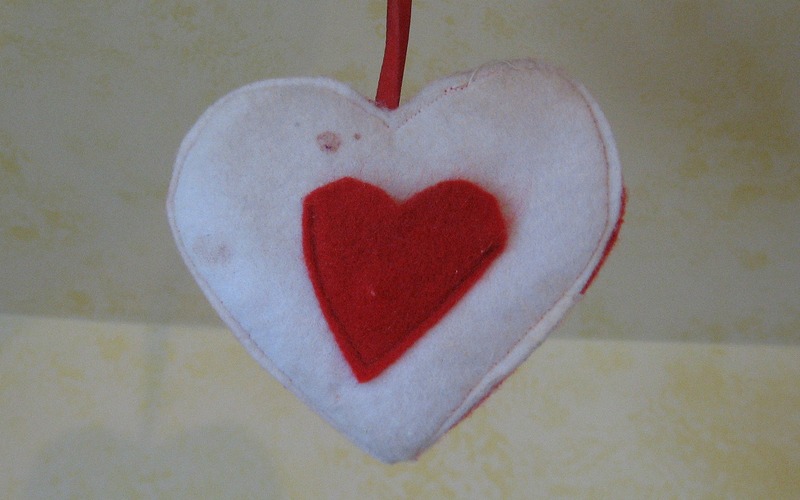 Your heart is ruling out a thousand careers you didn’t even know existed, simply because you haven’t heart of them. Go out and discover what you didn’t know before. Passion springs from being busy, not from sitting still. 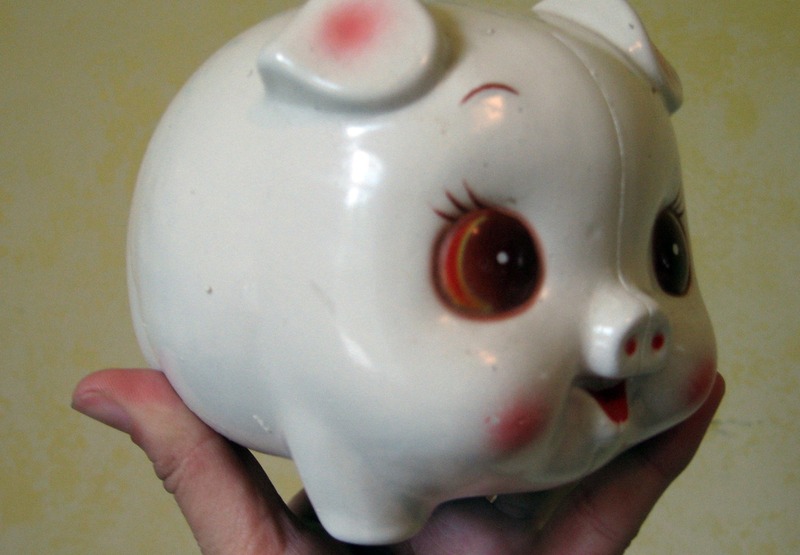 Five Reasons Today is Blah, and, Is There Any Hope For the Future? Yes, I get these too. Far too often, probably. I guess I shouldn’t be surprised, after five and a half weeks of excitement in Brazil, that I’d have a blah day once in a while when I got home again. Still, blah days are this awful middle ground when you don’t feel great (or even energetic, for that matter), but you also don’t feel down enough to be depressed. You don’t really feel like anything. It’s kind of yucky, actually. If it’s grey outside, I’m grey inside. Since I grew up on the sunny prairies, I need a lot of sun in my life. Rain makes me feel all cold, sticky and wet, even if I’m not actually standing in it. Fortunately, in Brazil, there was always hope it would clear up quickly, even though I was technically there in the rainy season. If the weather changes this weekend, I’ll probably feel better too. School starts next week. Actually, I love school, so it’s weird that I’m so ambivalent about this. But lately I’ve realized being a student is such a selfish existence – you’re studying so you have a better future, you’re spending money (or going into debt) so you have a better education. Not that a good future or good education is a bad thing. It just makes you so inward-focused. If I don’t do some volunteering, or contribute to society in some way this upcoming semester, I’m going to feel like a useless human being. The good thing about blah days is that they always go away eventually. What causes the blahs for you? And how do you get over them? I thought I’d give my faithful readers some idea of my life in a different culture, since some sort of explanation as to why this blog isn’t being updated as often might be nice! 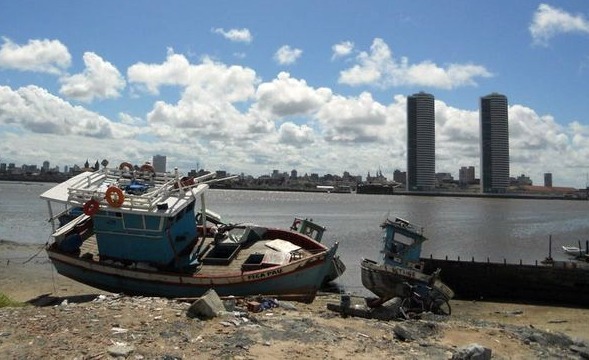 Recife, Brazil. Photo by Esther S.
I wake up in the morning around 7:30 (thankfully my fellow Canadian, Esther, has an alarm clock, or I’d never know what time is it…) For breakfast, Brazilian usually keep it simple bread (pão), maybe with cheese or eggs, and coffee. How I love the coffee part… the coffee here is always strong and sweet, and you can add milk if you want. I probably would never wake up if it weren’t for coffee. Of course, the bread is a no go for me as a celiac, so I’ve eaten a lot of eggs. And rice. Somehow, even though they eat rice all the time here, everyone still thinks it is incredibly weird to eat it for breakfast. But what’s a celiac to do? In the mornings, I spend of a lot of time practicing English with the people I’m staying with. They’re very enthusiastic students! Many people in Brazil do want to know English, as it’s very useful since so many books, etc., are in English. But I’ve never been anywhere where the average person knows less English than here. In Europe, it seemed like everyone knew enough English to help a poor, hapless tourist from Canada. Here, even in the airport, it is hard to find someone who speaks English fluently. Fortunately, the friends I am staying with do know a lot of English, and enjoy practicing. While practicing English with the Brazilians, I am still attempting to absorb as much Portuguese as possible. On rare occasions, I find myself understanding a whole paragraph. But more often, the random phrases I understand just confuse me. (Why are they talking about chickens? And policemen? And jiujitsu? And sharks?) If I understand enough to respond in Portuguese, it’s even better. It’s such a rush to have a conversation of more than two sentences in another language. Between all of this language stuff, I still find time to take a dip in the pool, learn about cooking in a Brazilian way, play Risk, and just get to know Brazilians better. Well, hopefully that’s enough to give you an idea. You can probably tell I’m enjoying myself. Unfortunately, before I know it, I’ll be on a plane back to Canada! 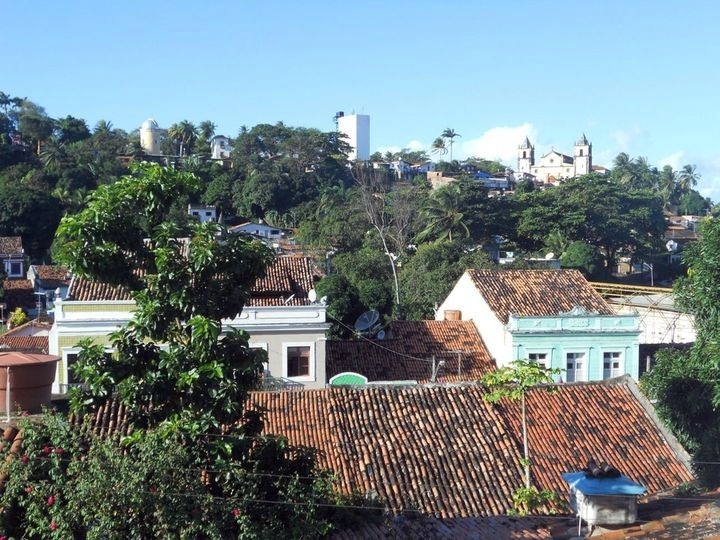 Olinda, a lovely seaside town. 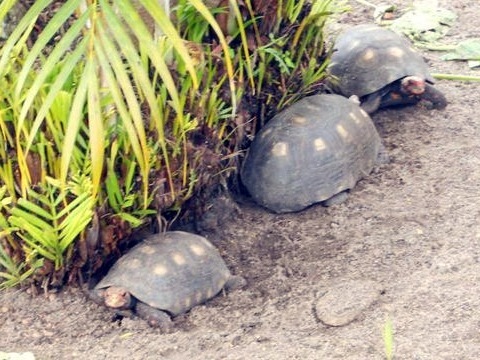 Photo by Esther S.
As you may know, I’m currently in Brazil–which means I need to know Portuguese to communicate. The area I’m in (northeast Brazil) has very few people who know English. I tried to learn as much Portuguese as I could before I got here, but it’s been a challenge for sure! At first, when I arrived Portuguese sounded like, “blah, blah, blah–word I know!–blah, blah, blah–voce (means ‘you’)–blah–agora (means ‘now’)” etc. But it gets better the more you try and try to understand it. Now, I’m so used to struggling to learn Portuguese than every word that crosses my mind comes with a Portuguese echo (if I know the Portuguese equivalent). So, like this: I (Eu) acho (think) that (que) I (eu) hear (ouvir) a Portuguese echo (um echo Portugues). If you know Portuguese at all, you know I’m missing all the accents and cedillas and so on. I don’t know how to do it on this computer (English computer, you see). Wish me luck with this strange new language! In psychology, they tell you that the closer you get to an event, the more your excitement increases – and the more your anxiety increases. In fact, your anxiety rises faster than your excitement. Yes, that’s why they make you buy your plane tickets ahead of time. You can’t back out so easily. 1.) What if I don’t make it there? One of my worst nightmares is getting stranded in Chicago or something. Or worse, in Sao Paulo, 1,300 miles away from where I’m supposed to be (and from anyone I vaguely know). I’m flown before, to Europe, but not by myself. And flying has never scared me before, but suddenly I notice the hundreds of things that could go wrong… bags stolen, strip-searched by security, suspected of drug-trafficking or being a terrorist, missing a flight… Oh goodness, now I sound neurotic. 2.) What if I can’t handle the stress? I’ve never travelled so far alone before, so I hope I can keep a cool head on my shoulders to deal with whatever issues come up. Travelling is fun, but not always completely stress-free. Last year I had some issues with anxiety and stress. This year seems to be better… let’s hope it stays that way! 3.) What if I can’t speak Portuguese? All the same, the day of departure is coming up fast! I’ve scheduled a few blog posts to show up when I’m gone, and for Polly, the Princess, the Enchanter and the Jadess to continue, but if I have computer access in Brazil I may add a couple travel posts as well. Stay tuned for that! If you enjoyed any of the contents of this blog, click “Sign me up!” in the column to your right. That way you’ll always be up-to-date! Or, if you are a WordPress user, you can always click “subscribe” at the top. Thanks for visiting, and do share your opinions in the comments below! This is apparently a tooth-holder. For putting your baby teeth in when waiting for the Tooth Fairy to come. I got it as a gift in playschool. 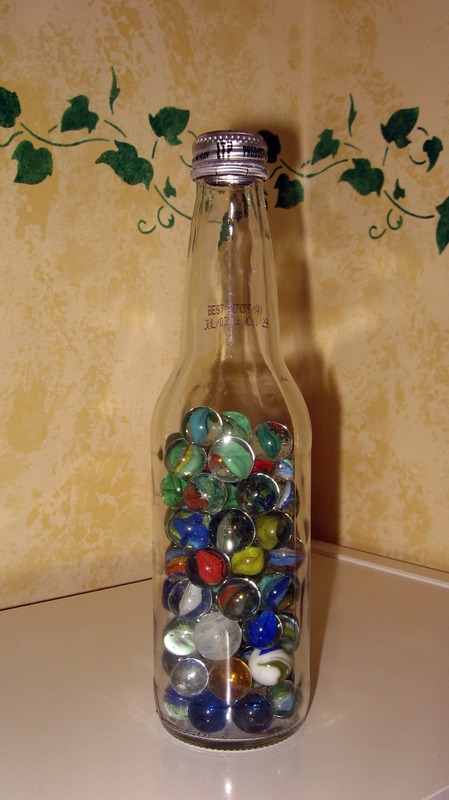 To illustrate my skill as an interior decorator, here is my brilliant idea to fill an old Jones Soda bottle with my dad’s old marbles. Doesn’t it just ooze with originality? Now THIS is a pen. It would be a pretty neat idea for a pen too, if the pen actually worked. 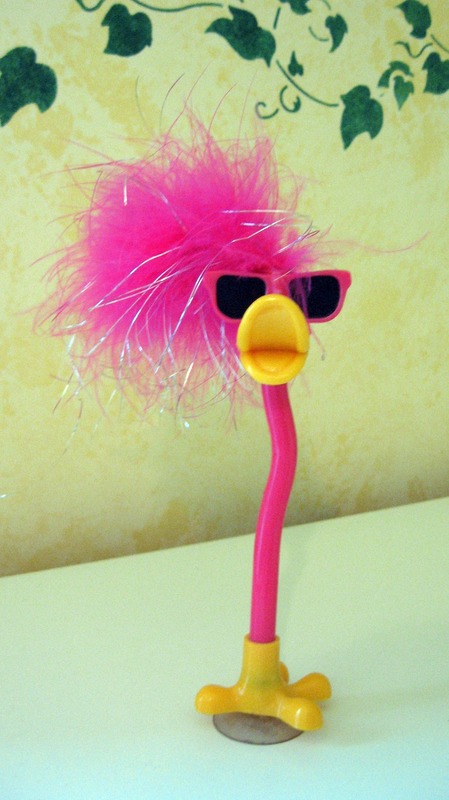 The long, skinny part detaches from his foot, which acts as kind of a pen-stand. 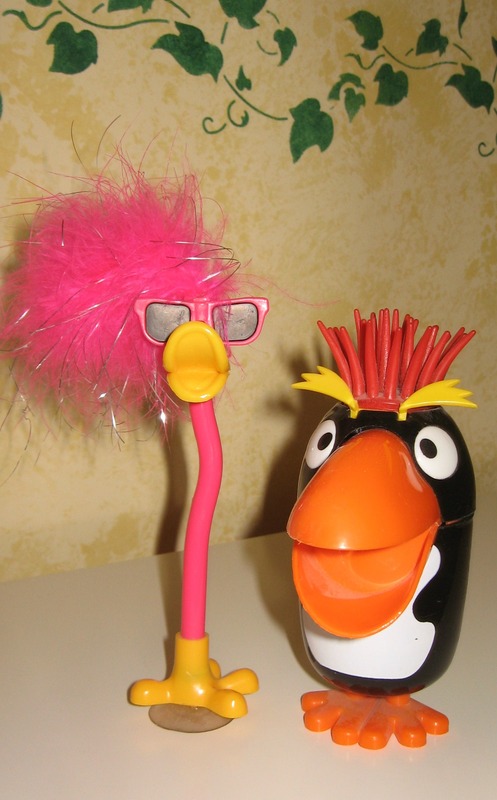 The dude on the left is the aforementioned pen. The dude on the right is – er… a souvenir from Holland. It actually opens in the middle, and you eat ice cream from its belly. My sister and I got one for dessert, after eating dinner at a pancake restaraunt (yes, they eat pancakes for dinner in Holland). 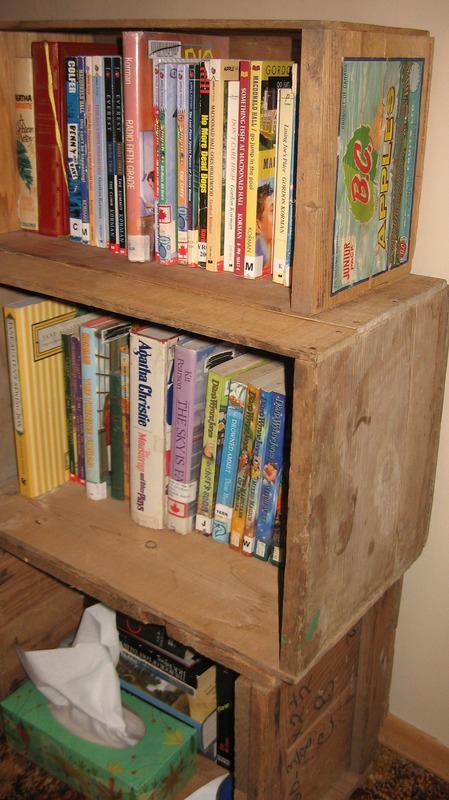 And lastly, my lovely bookshelf is made of vintage apple crates I rescued from my grandparents’ garage. The crates have come in very handy, actually. The one thing I’ve learned from all this cleaning is – I have too many books! Is that even possible? Maybe it’s time for me to go buy a Kindle or something. Or: Aaaaaaaaaah, How Do I Keep Track? I haven’t come up with a good organizational system to keep updated on the blogs I follow yet. Not that I’m the most organized person on the planet – see last week’s post for the messy system I came up with to keep my notes for my novel straight. But it seems like there’s a million different ways to keep up with people’s blogs, and none of them work quite as well as I’d like them to. The easiest method is with WordPress (the blogging platform I use, in case you didn’t know). If you have a WordPress account, you can just click on the little “subscribe” button at the top of the blogs you find interesting. Of course, this means you have to be signed in to WordPress to read your subscriptions, but I usually catch up with them before or after I make a post myself. The downside is this only works for WordPress blogs. Blogger, Tumblr, etc. you have to find another method for. The other tool I use is Google Reader. If you have a Google account (for Gmail, GoogleDocs, etc.) you can get into Google Reader and type in the web addresses of the blogs you want to follow. The handy thing is you can organize blogs into folders according to topic or whatever you want, which is what I’ve down. My problem is I’ve got lots of blogs on here, and I forget to check this (mainly because I have to sign in to check it). As a result, my Google Reader currently says I have 500 or so updates to read, which I’m never going to catch up on. Also, if I read a blog without going through Google Reader first, it says that update is still unread, even though I’ve read it. Another method is through email updates. There are only a couple blogs that I follow this way, mainly because I don’t really want to clutter up my inbox. If I get really lazy, I sometimes use my browser to bookmark blogs, because I don’t have to sign in to do this. Unfortunately, bookmarks don’t tell you about updates. And they’re not there if you happen to use a different computer. The last way I keep up is to click on the person’s name every time they comment on Stories and Stuff, just to see if they’ve updated since I checked last. Sometimes it’s a good reminder, because I realize somehow I’d lost track of one of the blogs I’m interested in. As a result, I often read blogs in batches, catching up on the last five posts someone wrote all at the same time. So if you’re wondering why sometimes I have five comments all at once, when I haven’t dropped by for a little while, just blame it on my disorganized system of staying updated. What about you? What methods to you use to stay up-to-date, and how well do they work? I’ve graduated from blackboards to a world of overhead projectors, PowerPoints and videos. Which don’t work half the time. Then the prof has to call the tech guys, who don’t show up till half an hours later, while we all fiddle in our seats and marvel at the way technology has simplified our world. You are suddenly surrounded by people who care about good grades. On the other hand, there are enough people that make you wonder how did they ever get in nursing?!? No class takes as much time and effort as the prof would like you to believe it does on the first day. I still don’t understand why nursing profs liked to scare us so much… though the classes took up enough time and effort as it was. I did finally get to dust off my fancy TI83 for Statistics class this year. You will be reminded again why English is useless. And reminded again, and again…. and I say this as someone who likes writing. Professor-jokes are not any more funny than teacher jokes. They will decide to implement a completely new class for your year because of what a few students said the year before. It will be the stupidest class ever, so they’ll decide to take it out again for the year after you. Lucky you. There will always be someone who makes flashcards for everything. I still think making flashcards is a waste of time… more time making them than studying. Significant digits go out the window when calculating drug amounts. You will not be a loner all year, like you thought you would on your first day. Though it’s entirely possible some of the friend you made in first year you’ll never see again. If your class project requires you to find complete strangers and teach them how to hand-wash, you will somehow end up at the restaurant your partner works at, teaching her brother and her best friend. The nursing faculty will swear to you that the program you’re learning (Context-Based Learning) is best program for learning since sliced bread. You wonder why, if that’s so, they’re putting a completely different program next year? Never start a program in a transition year, unless you like being a guinea pig. Just because you’re in college, doesn’t mean everything will be more organized. Your classrooms WILL be switched every week, and always to a room on the other side of the campus, ensuring half the class gets lost on the way. Sadly, university is even less organized. This might only apply to nursing, but actually was true. When you get a prof who actually knows her stuff and doesn’t use PowerPoint, you will be so thankful that you’ll tell everyone she’s the best prof in the world. This realization is only heightened when she is absent and the substitute spends an hour and a half showing you pictures out of your textbook. If you got a nice new shelf in the summer to put all your junk on, it will be filled up with books by the end of the year and you STILL won’t have a place to put your junk. Choir is suddenly a viable recreational option because you miss your highschool band class. Your new yearly music trip now consists of going to sing in Neerlandia. People will complain the college’s Student’s Association does nothing, and you will be amazed because it is a thousand times more active than your Student Council was in high school. There is no way to avoid coffee addiction. Yet it’s still all too easy to sleep in class. You will learn how to procrastinate like never before – making this list, for example. And that is AFTER I spent a couple hours last night organizing my notes. Since I have a lot more free time (in theory) than I do during school, I am trying to get a large chunk of writing completed on my latest novel. I’m posting this pic because I like how it displays the messiness of my thought processes. For a long time I didn’t have a dedicated place to write. Since I can write just about anywhere, I didn’t see a need for it. But it is useful to have a place to spread your stuff around without having to pack it up all the time. Where do you write? 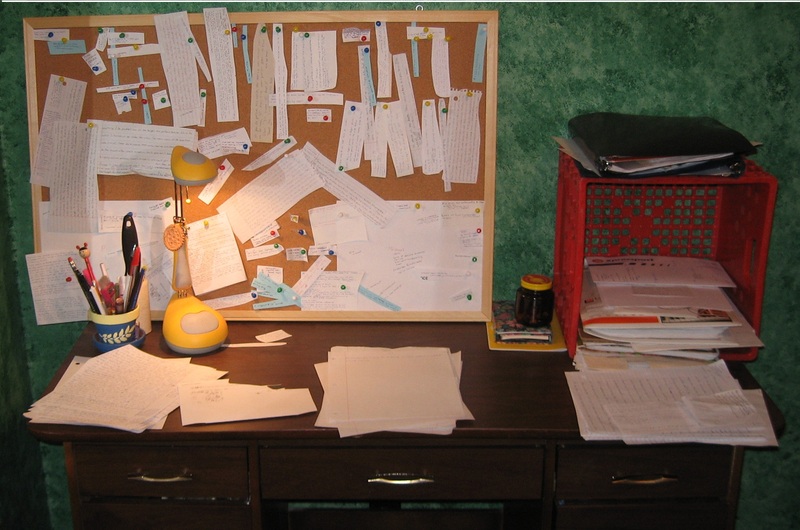 Do you tack your story ideas to the wall (bulletin board) just like me, or do you have a better system? I hate it when people tell you, “This will change your life forever.” Because it doesn’t. Or, looking it from the other side of things, every experience changes your life a little (if I go to class today my life is different than if I’d skipped). People say this about all kinds of things: books, movies, trips to other countries, experiences they think you should have. What they really mean is that whatever it is will have a stronger impact on you than most other things in life do. Or, more cynically, this book/movie/experience gave them insight into something in their life, so how can it not have an impact on your life? First of all, it raises expectations too high. Insisting something’s great could possibly have a psychological impact – maybe if you say it enough everyone else will convince themselves it’s great too. But this doesn’t always happen. How many times have you read a book recommended by someone, and been disappointed? Or what if it was actually good, but not life-changing? Then calling it “good” hardly seems good in comparison to what it was supposed to be. Now, unfortunately, the phrase “this will change your life,” make me react with cynicism. “Yeah, probably about as much as the last life-changing experience did.” Huge changes in my life would be: finding a career, moving to a different city, getting married, having kids, having a natural disaster hit suddenly, etc. None of which can be predicted by anyone else. Who do you think you are, predicting something will change my life? A fortune-teller? A prophet? Like so many phrases in the English language, I can keep twisting these annoying words to mean ridiculous things, but that’s not the point. I know people usually mean well when they say them (unless they’re trying to sell you something). They really want you to be as excited over this thing as they are. I just want to point out that just because I can see your excitement and want to share your excitement, doesn’t mean I will. Sometimes the gap between two different people’s experiences is just too far to close. What do you think? Have you been told something would be life-changing, and was it actually?